Pest Control Contract Service Agreements, Pest Control Form Service Orders, Invoices, Service and Maintenance Agreement, Guarantees, Service Invoices, Service Report, Pest Control Inspection forms, Work Orders. An all purpose pest control service form to propose your services may also be used during pest inspections to leave with customer should he wish to consider your services. Check boxes with pest names and check boxes for frequency of service, both make write-ups fast. Section to enter technician remarks and Very flexible to customize to meet your individual pest control service and proposal needs. 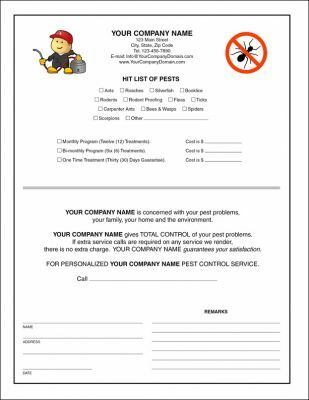 A pest control form, can be used as a job or work order, service call form, inspection, treatment, or service and maintenance form, for residential, commercial, indoor and outdoor service calls. 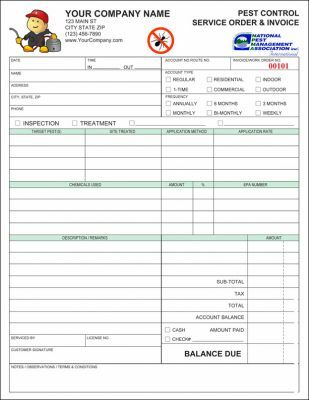 Fill out fast with easy to fill in customer information section, account type, frequency call -if needed, target pests, treated areas, application methods and chemicals used and charged rate. Form has all the essentials sections to keep your pest control form up to date to save you time and money with this proven and popular, all purpose pest control form. Interactive PDF form is self calculating, adjusting for areas to be cleaned, additional services added or removed, sales tax -if required, end user blank total summary fields makes it easy to modify the form with your own fixed or rated charges such as service call fee, special treatments, etc.